The cathedral city of Angouleme is home to over 100,00 inhabitants. During its long and varied history it has been fought over many times, mainly on religious grounds. It has also been an important strategic city in the hundred years war. The city's economy use to be driven by the papermills but this industry has now sadly gone. 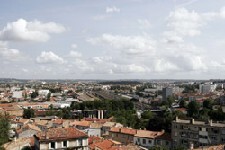 Angouleme is split into two parts. The historical Angouleme sits majestically on a hill above the Charente, while the modern, industrial Angouleme lies in the valley below. It is in this bustling part of the city that you will find a rich labyrinth of winding alleys and streets. The writer Balzac viewed wrote of Angouleme: "Up above the Nobility and Power, below, commerce and money. Two social zones that can't stop viewing each other as enemies." Although, most people who visit the city say that it's a lot more friendly than he suggests! Angouleme's 12th Century Cathedral is an impressive sight despite suffering much over the years. The Bishops Palace has been taken over for an art museum. For a bite to eat, simply pop into any of Angouleme's fantastic restaurants. Both international and French cuisine is served throughout the city. Historic in More Ways than One! The Old Town contains many interesting reminders of its historical significance as a fortress town. You can walk right round it on foot, although this is probably not wise in September when it becomes the track for the town's vintage car racing. Angouleme earned its place in history in 1806 when a local took France's first motor powered flight. His accomplishment seemed well worth the broken leg he had to endure afterwards. If you walk around the ramparts you can find the plaque that marks the infamous spot. If you're interested in French comic books and cartoons then you can pop into the 'Musee de la Bande Dessinee', a former papermill that has been turned into a museum. It is worth going just to admire the beautifully transformed building itself. Angouleme enjoys a healthy lifestyle and a pleasant climate. Bikes can be hired on arrival and it is well worth it with so many splendid cycle paths around. The coastline is an easy excursion away and is certainly not to be missed. Its long sandy beaches are world-renowned and attract many surfers. Although, If golfing is more you're thing then you're also in luck. There are a number of fine courses for you to practice your swing on. The region is considered an ideal place to have a summer vacation. The city has its own airport but it's only for domestic flights. Poitiers, Limoges and La Rochelle all have direct flights from the UK. Access to Angouleme once you're there is very easy. Cognac is about 45 minutes away, Limoges, 50 and Poitiers, an hour. The property prices in Angouleme are slightly higher than surrounding Poitou-Charentes. However, the rental market is busy year round and so there is plenty of opportunity to get some money back on your investment. Do you know Angouleme better than we do? Do you have photos of Angouleme? Slightly to the south of the centre of the Charente department. Access: Has its own domestic airport. For travelling direct from the UK you will have to go to Poitiers, Limoges or La Rochelle. Economy: Once dominated by paper mills. Now moving into a service economy. Interesting fact: The town comprises of two smaller zones, one commercial, the other historical.